Ben Vehorn is on the short list of EarthQuaker Devices employees that has been with the company since our days as a fledgling basement operation. He spent many years riding the “Night Train” (the nickname for our second shift crew) but lately he’s only been available as a hired gun for trade shows and builder during the hectic holiday months. His studio, Tangerine Sound, in Akron’s historic North Hill neighborhood, has become his main focus, as he’s begun pushing faders for both local and national acts with increased regularity. 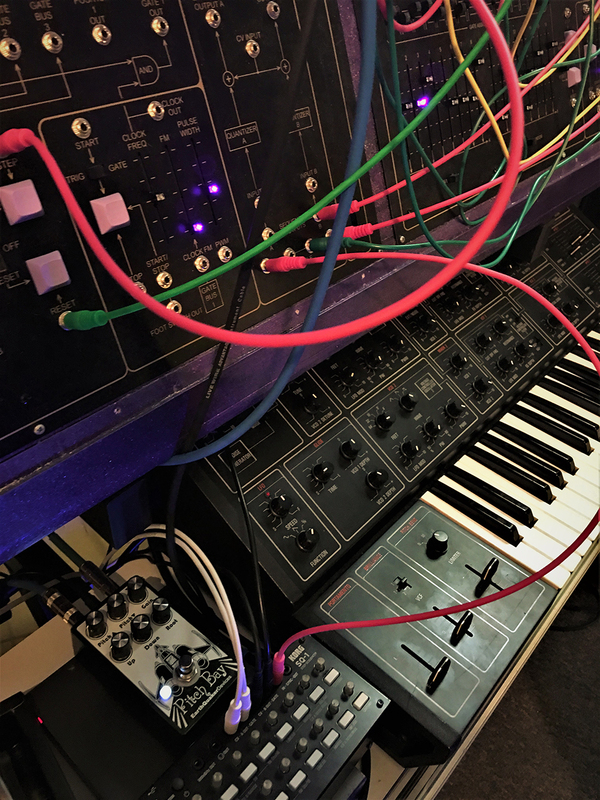 It has become a favored destination for those seeking calm, hardworking environments, deep dives on wide ranging synthesis styles, and open minded, often experimental recording techniques. Ben was kind enough to serve us the old fashioned gear guru dish sesh that follows. Ben Vehorn, primary instruments would be microphones, mixing console and outboard effects since I'm first and foremost an audio engineer. My primary instrument from a player's standpoint would be the synthesizer, and my all-time favorite/most used are the Roland Jupiter 4 and Polyfusion Modular system. List your current musical projects and a few that you've been involved with in the past. Engineering -- Currently, Stems and The Battle. In the past, some of my favs have been Relaxer, G.S. Schray, Houseguest, Extra Spooky, Love As Laughter, Strand of Oaks, Licorice Roots, Royal Bangs. Playing -- Currently working on a solo record and just started a duo with one of my favorite musicians Danny Potpourri. In the past, I've played with Gnosotros, My Wig Is On and Darclord. What is the goal of your rig and why? Are you going for a specific sound or more for variety? On the engineering side, the goal is to be able to quickly set up a quality audio chain that is as close to the way it will ultimately sound as possible. So yes, specific, but what that specific thing actually is, is different on a project by project basis and is often a moving target throughout the day as the band stretches out into a session. Flexibility and good sound are key. When producing and mixing, I'm usually going for a specific sound and this is where it becomes advantageous to have a lot of different flavors of the same thing, like delays, reverbs or EQs. On the playing side, I'm always looking for something that is fun to play, has a good tactile interface and makes me sound like I have more musical ability than I actually do. Flexibility in an instrument isn't as important as having a unique, pleasing character. What's in that chain, my dude? When recording, everything runs through my late-70s Auditronics 501 "Son of 36 Grand" console. I love the preamps and EQ but augment them with various outboard, my favorite of which is made by Overstayer Recording Equipment in Los Angeles. My most used microphones would be the Beyerdynamic M201 dynamic (snare, toms, amp cabs) and M500 ribbon mics (amp cabs and acoustic guitar), Neumann KM184 small-diaphragm condenser mic (cymbals, piano, acoustic sources) and the Lomo UM51 large-diaphragm condenser mic (vocals). When playing, my favorite signal chains would be Roland Jupiter 4 synthesizer through EQD Avalanche Run, Korg Mono/Poly into the EQD Space Spiral, and any sort of drum machine (usually Oberheim DX or Eurorack TR-808 clone modules by Falafular) into the EQD Pitch Bay and/or Rainbow Machine. Do you have any interesting stories about how or why you acquired a particular piece of gear? The stories would probably be interesting only to me, a lot of my gear has been swapped back and forth many times between friends and that's the stuff that has the most sentimental value, like John Elliott's blue Oakley modular synth or the Oberheim DX that Upstairs Josh recently gave me (thanks bud!). If you lost all your effects pedals, which one would absolutely need to be replaced first? Probably the EQD Tone Job, it gets used on pretty much every electric guitar recording I do. A close second would be the Pigtronix Keymaster, an essential utility for interfacing pedals in audio post-production. For personal use, probably the EQD Avalanche Run or Pitch Bay. Any pedals you've been digging recently? I really like the EQD Space Spiral and the Montreal Assembly Count to Five. Perennial non-EQD favs are the Strymon El Capistan, Electro-Harmonix HOG and Superego. Most of my favorite effects are in rack or tabletop/half-rack format, though, like the supremely weird Vesta-Kozo DIG-420 or the Boss RSD-10. Favorite pedal company outside of EarthQuaker? Electro-Harmonix and Strymon. I'm very intrigued by the Empress, Hologram Electronics and Mountainking Electronics stuff but have never had a chance to check them out in person -- hopefully one of these NAMMs I'll have the time and remaining ear capacity to go hear them in person! Brad Thorla is EarthQuaker’s fourth longest tenured employee, currently handling Inventory Systems Management, Artist Relations, 2nd/3rd camera, and you’ll usually see him at trade shows. He plays drums in the EQD house band, Relaxer, and his photography can be found on Instagram via @bradleythorla.